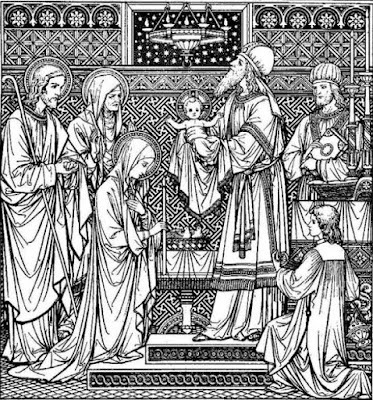 RORATE CÆLI: Fontgombault Sermon for Candlemas 2019: "Christ's Light has a price: the Cross"
We set off in the shepherds’ footsteps, and adored the Child in the crib, the Emmanuel. The course of liturgy illustrated the meaning of this name, “God with us,” through three manifestations or “epiphanies,” three special presences: when the Wise Men adore the Child in the crib and offer Him kingly presents; during His baptism by John, on the bank of Jordan, when both the Spirit, like a dove, and the Father, through His words, manifest also themselves and confirm the Baptist’s testimony; last, in Cana, where the water turned into wine heralds for the disciples the coming of the new times. The Presentation of Jesus in the Temple may appear as a new manifestation of the Lord, this time in the place where the heart of the Jewish people is beating. But the Lord hasn’t come solely to manifest Himself. He has a work to carry out, the reconciliation between God and man, in His Passover. Today’s feast, at the end of the Christmas cycle, leads us towards the acme of the liturgical year, the Paschal cycle. But light has a price, a price freely wanted and accepted by God: the fight against darkness, the Cross. In the footsteps of so many monks and nuns, religious and consecrated persons, both men and women, let us renew, after Christ and Mary, the total offering of our lives ad revelationem gentium, so that the heart of every man and woman may open up to God’s light.